Today, Apple held an event in which they unveiled the redesigned Nano and an upgraded iPod Touch with the new Retina Display and dun dun dun.. FaceTime camera! The rear camera can now record in HD as well! The new Touch goes for $229 for 8GB, $299 for 32GB, and $399 for 64GB. 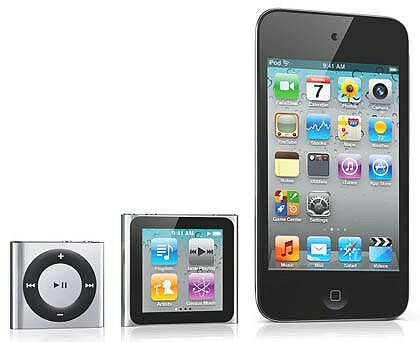 On the other hand, the new Nano looks cool with it's touch feature and smaller size. However, Apple fans have been calling it a downgrade due to the removal of the camera (which means no recording feature as well)! You be the judge! *there is something new about the Shuffle as well, but all together - why would you buy a shuffle? Thus I did not touch upon the subject!